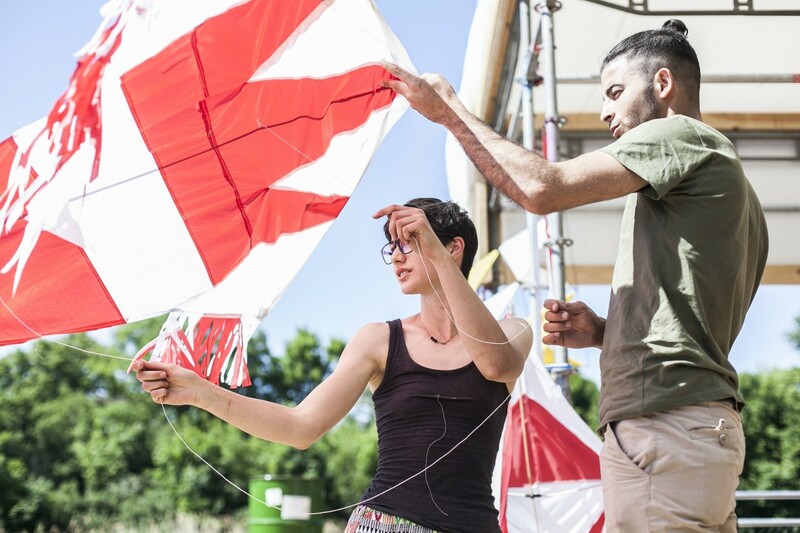 In May 2018, raumlaborberlin started an inner city offshore laboratory for collective, experimental learning. With numerous partners, including over 25 universities from all across Europe and 70 artists and other experts, we experimented with knowledge transfers and the formation of transdisciplinary networks to challenge routines and habits of urban practices. The idea for this experiment was created by finding an almost forgotten place in the center of Berlin: An old, concrete rainwater basin right next to the Tempelhof airfield that collects rainwater from the former airport building and its surroundings — plus all the dirt that comes along with that. This creates a dump that is also an inner city oasis, home to various animals and plants. Due to its centuries-long existence in the immediate vicinity of an airport, its surroundings have grown a special urban mixture consisting of cemeteries, sports fields and allotment gardens, which, combined with the successful transformation of the nearby airport field into an actual public park, intensifies the feeling of being in a recreational area of the city. Yet, the conversion of a high-emission infrastructure into a high-quality free space also evoked a constantly rising pressure on the surrounding properties. All of these conditions made it the right spot for us to build a generic structure that fosters sensitivity for decision-making. Since April, we built learning spaces, workshops, an auditorium, a performative laboratory tower for experimental water filtration systems, a mobile kitchen, and a fast food greenhouse. These spaces, all without walls, were created for exchanging knowledge within experimental, educational formats. A place where transdisciplinary research teams and diverse positions could come together to tackle the complex questions of urban practices. The project was structured in different phases that varied in its publicity. During three ‘Open Weeks’ in May, July and September, we invited the local and international public to explore the rainwater basin and the campus, as well as to participate in transdisciplinary workshops, lectures, seminars, hot tub talks, concerts and performances by artists and other experts. In between, groups of students from the cooperating universities came to stay for a week or even up to a month to hold seminars or have regular meetings, events and studios over the course of a semester. The Berlin-based students even took over the role of co-hosts by running the bar or designing and using the kitchen as a communication spot. 6000 people came over the course of the summer and investigated the daily routines and practices of urban living and formulated visions and ideas for a better future city. 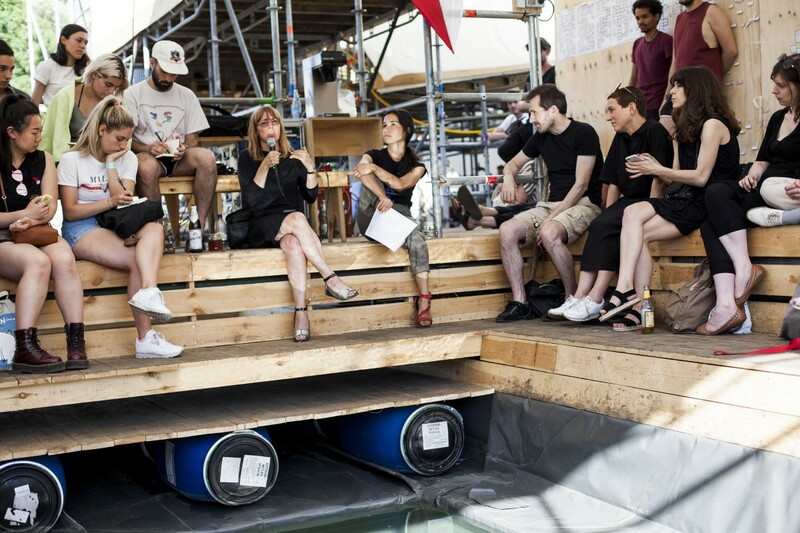 ”Lots of universities are slowly sinking; this one, the Floating University by raumlabor in Berlin near the ancient airport is making a place emerge out of a dump: just what is needed to ‘live in the ruins’ as Tsing argues“, Bruno Latour tweeted after he visited the campus in Spring 2018. After five months of prototyping a university as we imagine it and a huge wave of interest of all participating parties coming in, the project reached its peak in the Floating Symposium in September; as we tried to find visions for the basin and Floating University as a format of mutual learning, we decided to go for a long-term initiative. 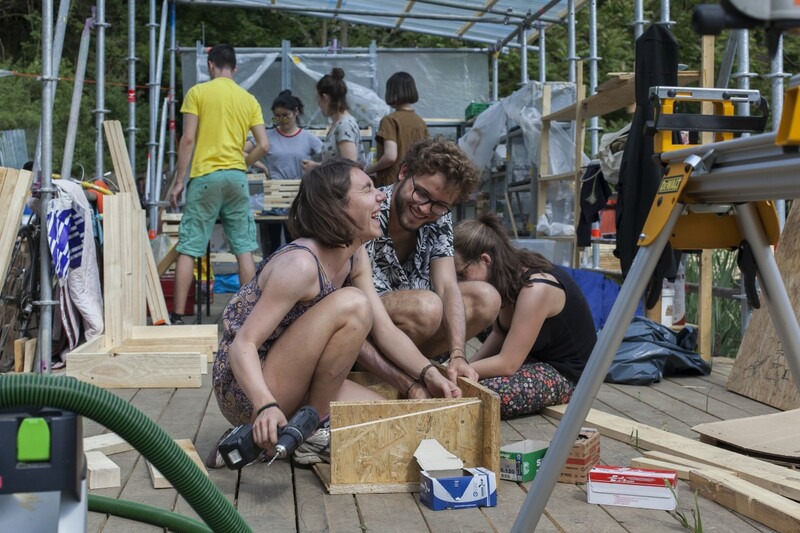 This November, the Floating University Association was founded, and is now the base to all future actions that are trying to create a more long-term architecture in the space: for instance, a sustainable rainwater system, a program that is both local and international and foresees a common use of the structures. After making Floating University emerge out of a dump, we will now work on ways to keep it alive.